Send a DCI care package to your favorite corps member! What would brighten any corps member's day while on the road? Receiving an official Drum Corps International Care Package, filled with essential items that will let them know someone's thinking of them! 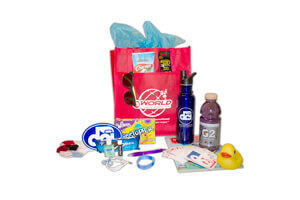 From Gatorade to candy to playing cards to Chapstick, each package comes in a convenient DCI tote and is filled with necessities and other fun items for corps members as they tour across the country this summer. Purchasers may choose between two different sized options, and we'll take care of the delivery to your corps member at any of the following competitions (choose when you order): Minneapolis (7/13), San Antonio (7/20), Atlanta (7/28), or Allentown, Pa. (8/2, 8/3). Take note: Care packages must be ordered in advance. Purchase yours by Friday, July 5 for delivery in Minneapolis (7/13), Tuesday, July 16 for delivery in San Antonio (7/20) or Atlanta (7/28), and Tuesday, July 30 for delivery in Allentown, Pa. (8/2, 8/3). Small Care Package — $25 Blue DCI Tote filled with: DCI Sunglasses, Chapstick, Hand Sanitizer, Glow Stick Bracelets, Candy, Oreos, Gatorade, Coloring Book, DCI Pen, DCI Silicone Bracelet, Mustache Temporary Tattoos Large Care Package — $50 Red DCI Tote filled with: All items from Small Care Package, plus - Watch, DCI Water Bottle, Socks (2 pairs), Wet Wipes, Motivational Rubber Duck, DCI Magnet, DCI Playing Cards, Headphones Order a DCI Care Package at DCIStore.org.